Here are some exercises to work with phrasal verbs at the lesson. This downloadable handout is best suited for high school students at Pre-intermediate (A2) level. 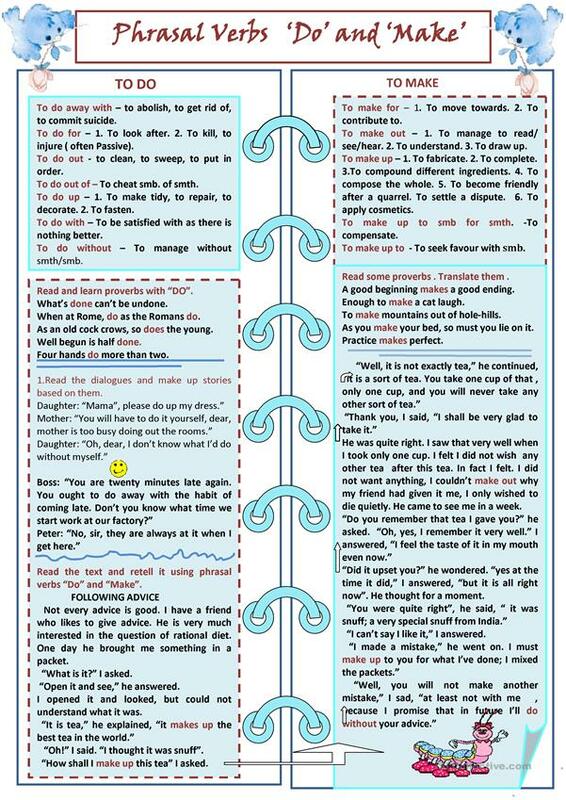 It is a useful material for teaching Phrasal verbs in English, and is a valuable material for enhancing your students' Reading and Writing skills. You will find the solution at the end of the worksheet. Devitsa is from/lives in Russia and has been a member of iSLCollective since 2010-05-30 00:19:51. Devitsa last logged in on 2016-11-30 04:34:16, and has shared 11 resources on iSLCollective so far.